Thien Farm Management was started in 1994 by Gary Thien and he was soon joined by sons David and Adam. They currently manage about 30,000 acres of land across Nebraska, Iowa, and Missouri with a focus on farm management, rural appraisal, agricultural consulting, agricultural property acquisition and sales, and more. 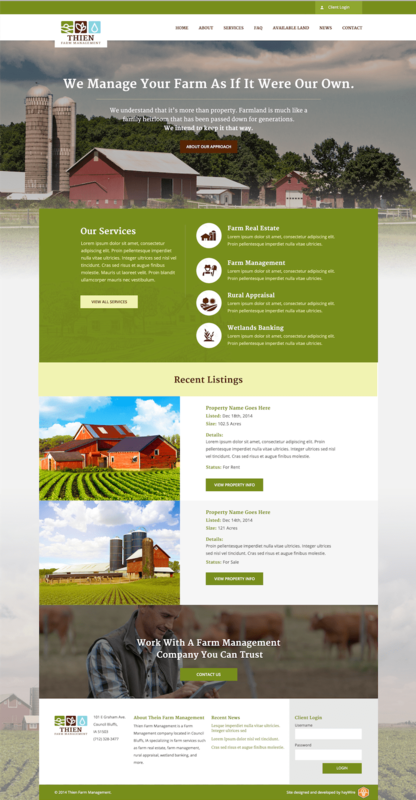 We were contacted by Thien Farm Management in 2014 to start building a new site for the company that would be easy to manage and mobile-friendly. The other component we had to consider is they needed a system for their clients to be able to log in and access client-specific documents secured by individual logins. Our goal was to use the existing functions of WordPress and customize them slightly to meet this need- without building a system from scratch (and therefore costlier to the client). Additionally, they simply had relied on a simple logo that was created long ago and we offered to freshen up the look to make it modern, appealing, and relevant. We knew nothing about farm management, but were about to learn a heck of a lot. 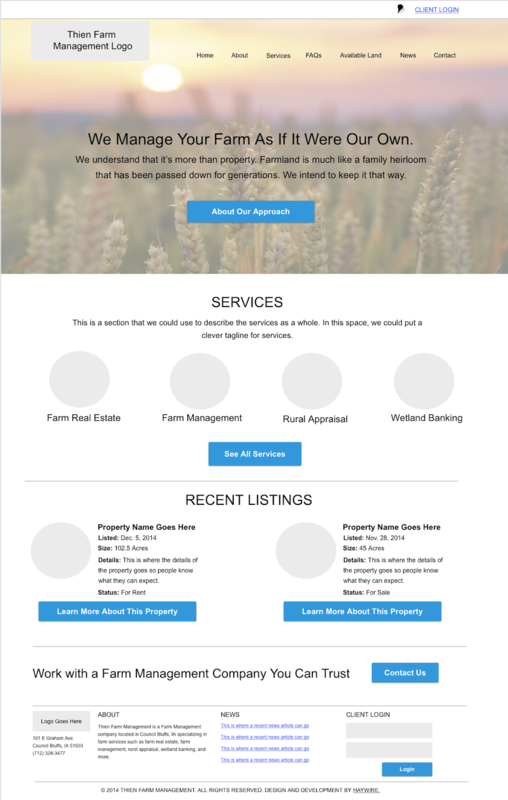 We worked closely with the team at Thien Farm Management to understand the demographic of users for their services and for their website. What became clear in our discussion was that farmland oftentimes represented farm more to their clients than simply land- it was a family heirloom. With this goal in mind, we need the design and copy for the site to come off as very approachable and trustworthy. The selling point would be to communicate that Thien Farm Management was a company you could trust with your family’s property. They would treat the land and the clients with the highest level of respect and always work towards your best interest. Once we got that down, it the design and copy came effortlessly. Additionally, we strategized towards the needs of user’s accessing files on the site and found a simple way (within the confines of WordPress) to create this function. The result was a responsive, easy-to-use, and functional site.